Several RC airplane forms are available depending on how much time and effort you want to spend on assembly. The more time and effort you put into building your very own model airplane, the more rewarding it is to see her rise to the sky on the maiden voyage. This my friend, can be a double-edged sword! The more heart and soul you put into creating your new bird the more it hurts to see her crash...You can build from a kit, assemble an ARF, build from scratch, or just buy an airplane that's ready to fly right out of the box. Just like granny’s cooked from scratch homemade fudge at Christmas time, scratch built RC airplanes are built from the ground up. Instead of a recipe, you start with a set of plans. 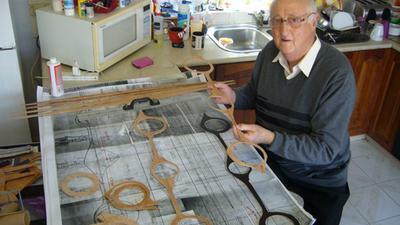 You supply all the material and meticulously hand cut each piece of balsa. Granny’s fudge is the best in town because she’s spent years perfecting it. Building RC planes from scratch is no different. It requires extensive modeling experience and is not recommended for a first time builder. One thing for sure though, a unique snazzy looking scratch built plane will turn heads at the flying field! Most people build RC airplanes from a kit that comes with all the balsa wood parts pre-cut with detailed step-by-step instructions right in the box. RC airplane forms of this type also come with all of the hardware, control linkages, wheels, spinner, and just about everything you need to build your airplane. You still need to buy the covering equipment, glue, razor blades etc. .
After you have the skeleton of your airplane all framed up, you get to cover it with any color or design you’d like. The covering is nothing more than a thin sheet of heat shrink plastic that you apply with an iron and pull it tight with a heat gun. This is where you can really make her stand out. I covered my first airplane in a Purdue Boilermaker theme! For more details on what it takes to build a kit, check out my Carl Goldberg Super Chipmunk at various stages of construction. This particular kit took me about 6 months to complete while working on it roughly 2-3 nights a week. Is this RC airplane form really Almost Ready to Fly? I remember the day I picked up my first ARF, the Sig Lt 40 trainer. I couldn't wait to get to the hobby store to pick up my "almost ready to fly" trainer! My plan was to pick it, put it together, and head to the flying field that night. After all, it’s "almost ready to fly", right? The hobby store owner pulled out the box, and my jaw dropped! Being the newbie that I was, I respond "No, I want the ARF, not the kit". He replied..."This is the ARF son, a kit is nothing more than a box of balsa sticks..."
Here is the box my Sig LT 40 ARF came in. Looks "almost ready to fly" doesn't it? An ARF is "almost ready to fly" ...WHEN COMPARED WITH A KIT! It took me about a week to put her together, and I was hurrying too! RC airplane forms of this type come with the fuselage and wings pre-built and covered. Just like building a kit, you have to align and glue the horizontal and vertical stabilizers to the fuselage. You also get to install all of the control surfaces, control horns, control rods, control linkages, servos, radio receiver and power plant. The landing gear, wheel pants, and cowling may or may not be installed at the factory depending on the particular ARF. In today's fast paced world, many people simply don't have the time to tinker in the garage for hours building radio controlled airplanes. Or more likely... their wives just won't tolerate all that time in the garage when she's taking care of the kids! 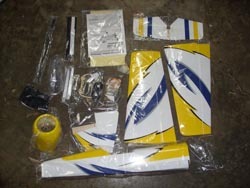 Want to fly RC airplanes but don't have the time for building them or putting them together? A ready to fly RC airplane is for you! RC airplane forms of this type literally come "ready to fly"! None of this "almost" business. The receiver, servos, and power plant are already installed and ready to go. All you have to do is charge the batteries and go fly!